The Guardian Fall Protection CB-18 Roof Anchor, along with the entire CB Anchor family, is perhaps the most proven fall protection anchor on the market. It is intended for permanent applications only, and is compatible for installation onto wood, steel, and concrete substrates (fasteners are included for wood and steel applications). 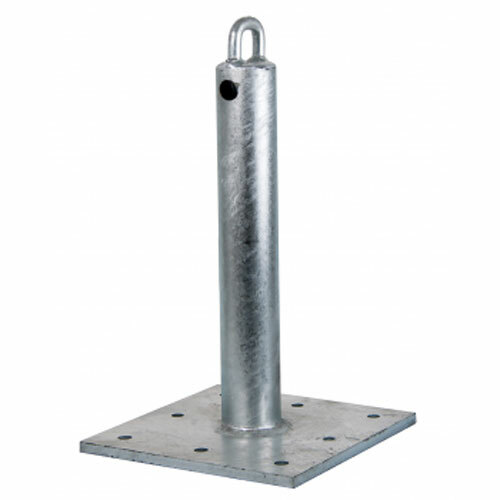 The 18" anchor post functions to extend through roofing so that it is accessible both during and after roof construction, and is compatible for use with SRLs, vertical lifelines, horizontal lifelines, and shock absorbing lanyards. The CB-18 is composed of durable, galvanized steel, and is an excellent choice for nearly any fall protection application.